Chicago is on the northest tip of Illinois. I'm confuse, in first sentence, "Good" as an adjective, modify subject "I", or linking verb 'IS". If "Good" modify subject "I", then what the matter about "ON THE NEAREST TIP" in the second sentence, as a prepositional phrase. Does it (On the nearest tip) work as an adjective, or as an adverb? It modifyes which (i.e. Chicago or IS)? 'Good' is a somewhat tricky word to use as an example, as it can be used as an adjective or adverb. It is probably more common as an adjective ('I am [a] good [person]'), but it is also increasingly used informally as an adverb to replace words like 'well' or 'fine' ("I'm good, thanks" invariably is used to mean 'I'm fine'). Anyway - assuming you mean "I am good" as an adjective, and the sentence means "I am a good person", then "good" modifies "I". Who is good? I am. 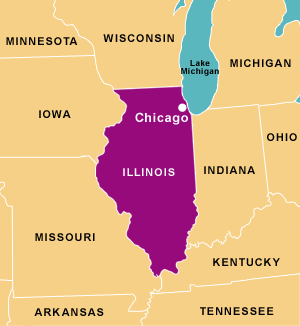 According to the Grammar handbook you link to, 'on the northeast tip of Illinois' is an adverb phrase, based on their logic that adjective phrases always immediately follow the noun they modify. Adverb phrases, in contrast, follow the verb. You are asking, in effect, how 'good' can be an adjective when it follows a verb, when that would be considered an adverb in a prepositional phrase. The reason is, "good" is not a prepositional phrase. It is simply an adjective. It is the preposition in the prepositional phrase which changes the 'rules', so to speak. Chicago is a city on the northeast tip of Illinois. The first, we are told, is an adverb phrase. The second is an adjective phrase. I'm happy to be enlightened by those that know better than I do about the usefulness of this distinction, but my initial reaction is 'so what?' The sentences are to all intents and purposes completely identical in meaning. In both cases, as @Mixolydian says, it is Chicago, the city, which is in effect being described, regardless of the precise grammatical distinctions. In each of your examples the word/phrase behaves as an adjective. "Good" modifies "I". The adverb "well" would be used instead of "good" if this were not an adjective (though in the sentence "I'm well," "well" actually means "in good health" - but that's not relevant. "I dance well" or "I speak English well" are examples of using the adverb "well" with the meaning "in a manner that is good"). Not the answer you're looking for? Browse other questions tagged adjectives adverbs phrases modifiers linking-verbs or ask your own question. What kind of adverbs can modify another adverb? Could this word, there, be read both adjective and adverb?